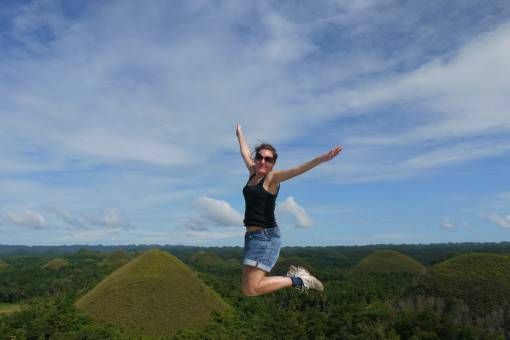 On arriving in the Philippines we headed straight for the beautiful island of Bohol in search of chocolate hills and tiny primates – here’s how we spent our whirlwind week on Bohol. 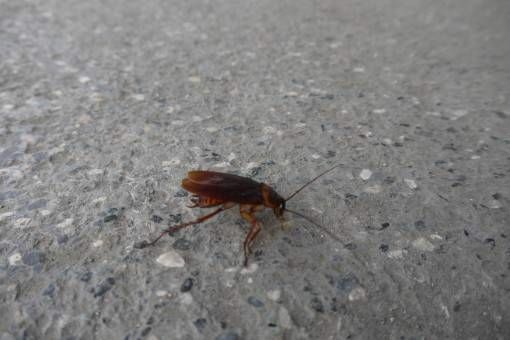 We spent our first couple of nights in Bohol near the port in Tagbilaran, which would have been great had I not been woken up in the middle of the first night by a giant winged cockroach scuttling over my arm; it took me a long time to get back to sleep after that. Cockroaches aside, we liked the relaxed feel of Bohol; every day the sun shone and everywhere we went we were greeted by polite locals who insisted on calling us Sir and Ma’am. 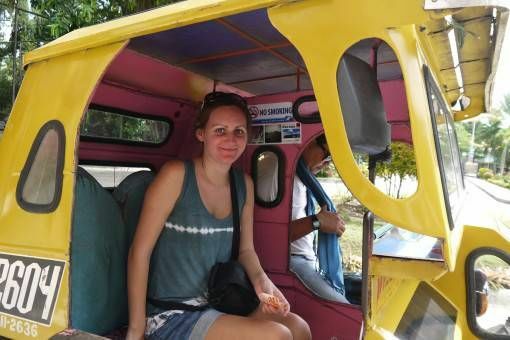 We enjoyed whizzing around in colourful trikes and jeepneys, most of which had bible quotes painted on the back; due to years of Spanish occupation the Philippines is an almost entirely Christian country. 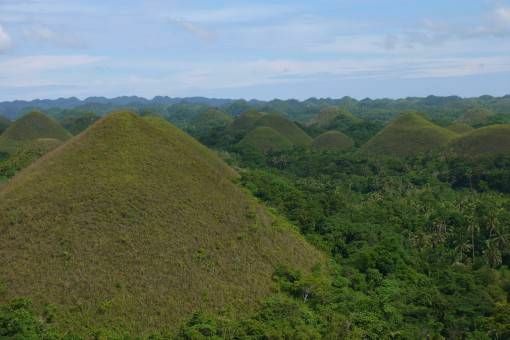 Bohol is most famous for its unique limestone formations – the chocolate hills, so called because their grassy tops turn brown from lack of rain in the dry season. We caught the local bus out to the hills and climbed up to the viewing platform; the mounds stretched as far as the eye could see in all directions making the view far more spectacular than we’d anticipated. We couldn’t resist taking some classic jumping shots while we were there! One of the things we’d most been looking forward to during our Bohol visit was catching a glimpse of one of the tiniest primates in the world – the tarsier. These fascinating creatures are so small they could easily fit in the palm of Andrew’s hand. 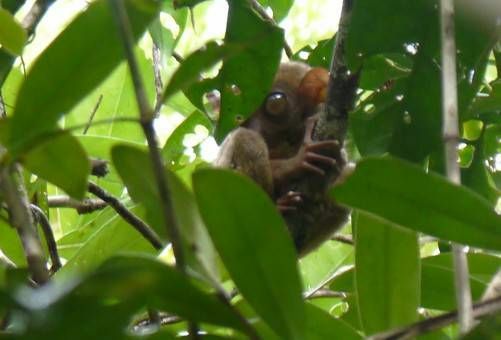 With bat-like ears, huge boggly eyes, long scaly tails which remind me of the pet rats we used to keep and an owl-like ability to swivel their heads 180 degrees, tarsiers are the strangest creatures I’ve ever seen. Unfortunately, the tarsier’s unique looks are partly to blame for the fact that they are now an endangered species. For years tarsiers were captured and kept as cute pets or used to make money from tourists with often deadly consequences – these animals are so sensitive that stress, captivity and repeated handling can cause them to commit suicide by bashing their heads against walls or simply holding their breath. Added to this, in the wild each tarsier needs around one hectare of forest to live comfortably and years of logging means their natural habitat has shrunk considerably. Now, the Philippine Tarsier Foundation, which we visited, has only 10 tarsiers living in its sanctuary; they estimate that there are just another 150 wild tarsiers living in the surrounding forests. 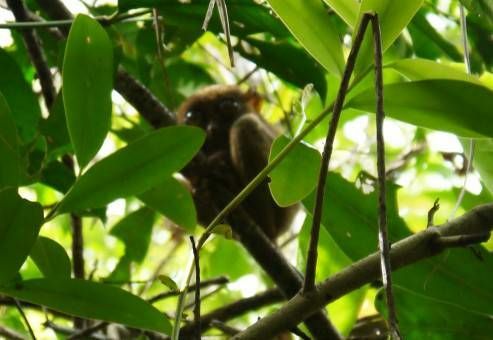 A volunteer guide showed us around the sanctuary and with her help (we never would have spotted them ourselves given that they’re so tiny and well camouflaged), we caught a glimpse of three fury little tarsiers clinging to branches high up in the trees. It was incredibly hard to get good pictures of the creatures but just seeing them was good enough; we were spellbound by these miniature animals and watched in awe as they stared back at us with their wide, other-worldly eyes. 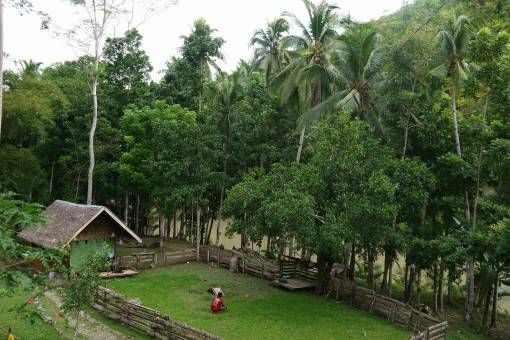 We loved our time in the jungles of Borneo so much that while we were in Bohol we spent a few days at a popular jungle retreat we’d read about online – Nuts Huts. To get there we caught a local bus which dropped us off at the end of a long rocky path ending in a steep flight of stairs down to the huts, which sit alongside the river. From the restaurant half-way up you get some fantastic views of the surrounding jungle and the river below; it was a great, quiet place to relax and there were even cute goats wandering around for us to play with. 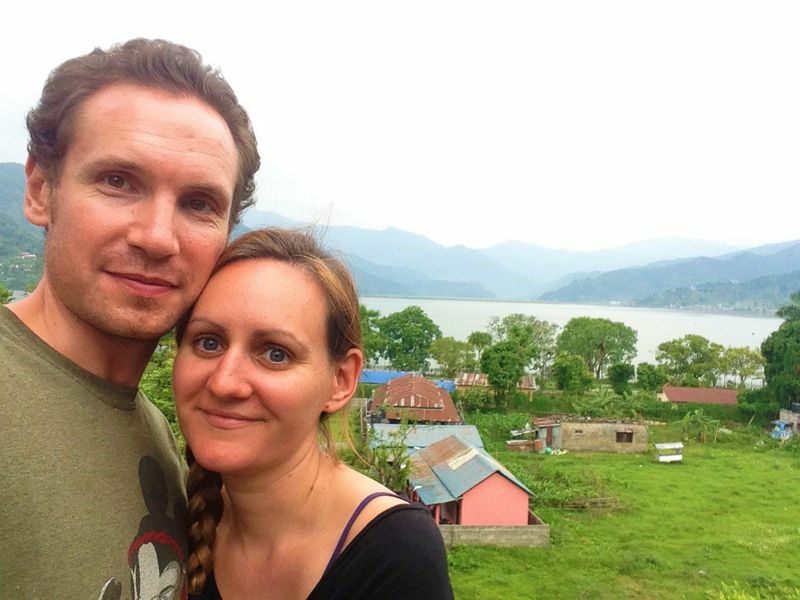 Since we’ve been travelling Andrew and I have figured out that we’re not really beach people, we prefer being in cities, jungles and mountains. Don’t get me wrong, we do love visiting islands, swimming and snorkelling but we’re not really great at just lying out on the sand all day so a week of beach-time now and then is about as much as we can handle without getting bored and burnt to a crisp. Given that and the fact we only had a three-week visa to explore the Philippines we hadn’t factored in any beach-time to our schedule. Plans are made to be broken though and at the last minute we decided to head down to Pangalao and check out the famous Alona beach, which wasn’t nearly as crowded as we’d expected it to be. Normally I love catching local transport as it’s cheap and gives you an opportunity to watch people going about their everyday lives, bur our jeepney journey down to Pangalao was an entirely different story. 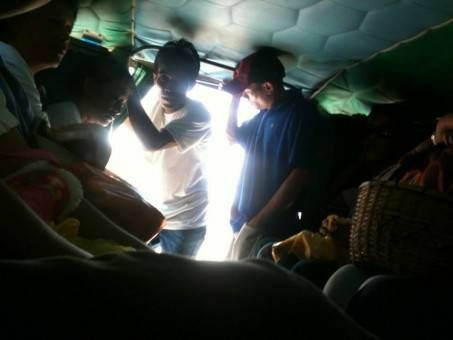 It was a tight fit to start with as we crammed in with around 20 other locals and tourists along the two narrow benches on either side of the van, so I was astounded when the driver started slipping wooden stools down the middle for people to perch on. It was a stifling day and the jeepney became hotter and more uncomfortable as people piled inside carrying shopping, school bags and even a baby. Totally unconcerned by the crush, locals hopped on, standing on the back steps while hordes of school boys scrambled up the sides to sit on the roof. By the end of the journey I was feeling pretty panicky as the roof buckled every time we went over a bump and my brain began conjuring images of it caving in and squashing us all. After that journey we had to confront another scary form of transport – a scooter. I know that millions of travellers and locals zip around quite comfortably on scooters in Asia but Andrew and I have always been pretty nervous about getting on one ourselves. We have no experience of driving scooters and have been scared off by the amount of nasty bike injuries we’ve seen tourists suffer while we’ve been travelling. However, the hotel we were staying at in Pangalao was so far out from Alonha beach and trikes were so expensive there that we had no choice but to use the free scooters offered that came with the room. After some instruction from the receptionist we set off hesitantly on the bike, crawling along over the rocky paths and watching obsessively for other drivers. Although it wasn’t as bad as we anticipated, we still feel safer sticking to other forms of transport. One thing that had been worrying me about visiting the Philippines was the food. 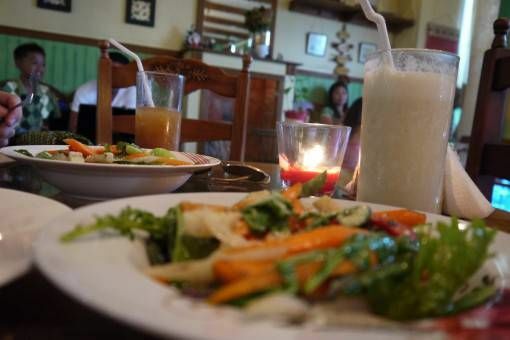 I’d heard that the local cuisine wasn’t very vegetarian-friendly and I was expecting three weeks of rice and crackers, so I was delighted to discover The Buzz restaurant while we were in Bohol. 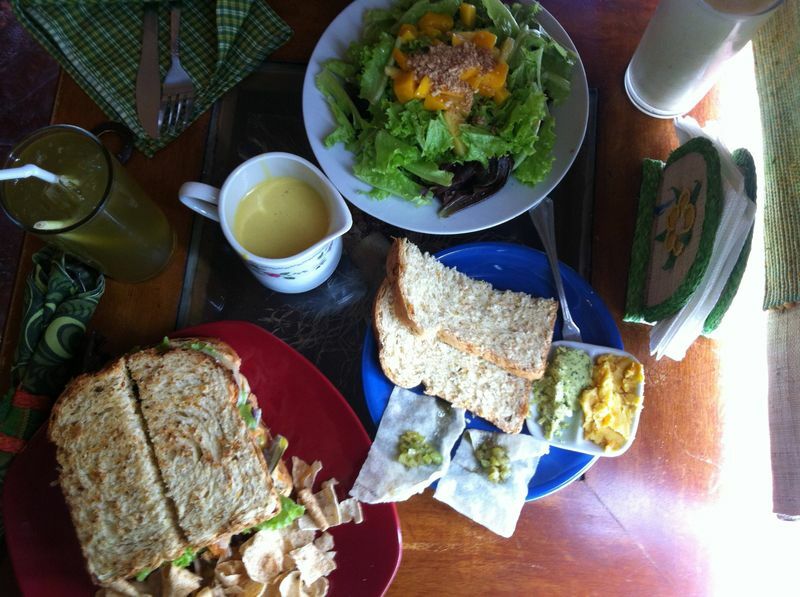 Owned by the Bohol Bee Farm, this restaurant had plenty of veggie dishes and fresh organic produce and we both gorged ourselves on as many of their tasty meals as we could during our week in Bohol. Hi Jimmy, welcome and thanks for commenting! Andrew was pleased with your compliments about his jumping skills! The tarsiers were certainly very alien-like but pretty cute too – much better than a cockroach on the arm, that’s for sure. Sounds as if you really enjoyed the experience – minus the creepy crawly! I’d die if I woke up and found one of those on my arm! You’re much braver, Amy, than I am. Aside from that though the pictures are pretty and kudos for you for taking on the scooters – did you get carsick riding on the bus all crammed in like that? I know, I was pretty freaked out by the cockroach incident too Patti! 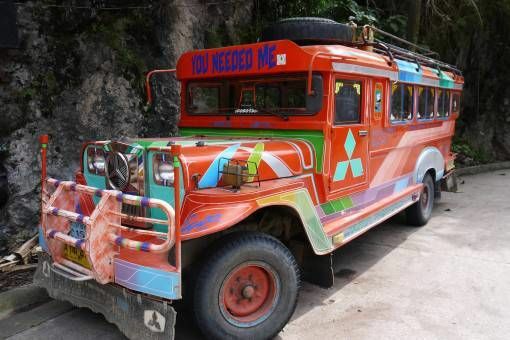 Strangely, I didn’t get carsick on the jeepney, I was just terrified that the roof would cave in or the bus would tip over on one side because of the amount of weight it was carrying – the locals seemed pretty unconcerned though! 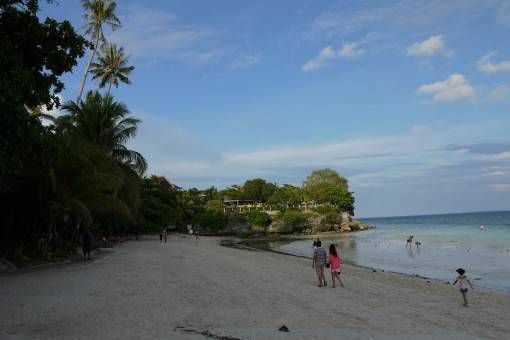 I think Bohol is the perfect place to start one’s Philippines adventures—we began there too and although we were disappointed by the beaches we found down in Panglao (we were really unimpressed with Alona), we discovered there were a lot of wonderful attractions within the interior of the island. I’m glad you guys enjoyed the hotel you stayed at on Panglao—we really loved the free motorcycle, but given Tony’s lifetime of riding experience, it was far less stressful for us (though Tagbilaran was an experience for sure). That ride out to the chocolate hills is so spectacular, I can’t imagine doing it any other way! 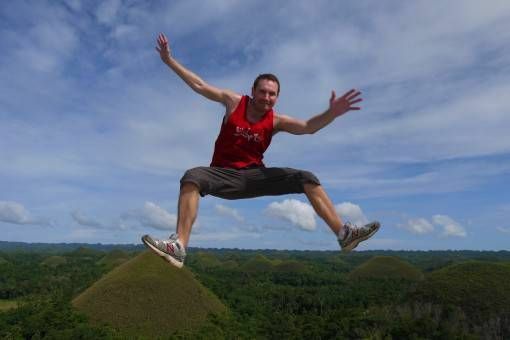 Bohol definitely was the best place to start our Philippine adventures although we’ve certainly seen better beaches during our travels to date. Calypso was great value for money, thanks for recommending it on your site; I’m glad we had a go on the scooter and I can imagine riding out to the Hills would have been pretty amazing. Maybe we’ll feel confident enough to give the scooter another go one day! Wonderful post. I am really enjoying browsing your website. Question: To what extent did you two plan/research your trip before leaving? We are getting set to leave on an adventure of our own, departing May 2014. We are doing a fair amount of research on what to see and do and which places to go, but we are not going into detail. What have you found is the best approach to this? 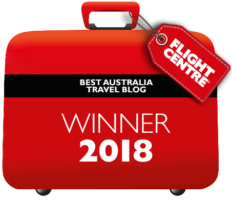 Hi Stephie, we did a lot of research about our first stop, New Zealand, before we left the UK, including booking accommodation and activities. Since then we’ve done less and less forward planning, we tend to get a rough idea of what we plan to do in a country and then add/change plans once we arrive based on recommendations. Bear in mind though that you can almost always organise accommodation and transport as you go, so don’t get bogged down too much with itineraries and bookings.